The information you’re about to read is just one of the powerful lessons taught in Creative Mastery, taught by Ableton Certified Trainer, Vespers. After taking Creative Mastery we guarantee you’ll learn how to finish the songs you start, gain access to an unlimited reservoir of creative energy, and be massively inspired. Learn more about Creative Mastery here. At one time or another, all artists struggle with focus, productivity and completion of projects they’re satisfied with. Over my time as a musician and entrepreneur, I’ve invested hundreds of hours and thousands of dollars into personal development. Many of the courses I’ve attended have been oriented towards focus and productivity. I’d like to highlight some of the key lessons that personally had the most impact on my focus and productivity, and share with you how they can be applied to increase your productivity in the studio. One caveat: Unfortunately, most of you’re likely to read this, nod your heads, and think many of these tips are great ideas, but never actually implement them effectively in your daily routine. Such is life and human nature. However, those of you who choose to take this seriously, and powerfully bring this system into existence in your life, will experience nothing short of an epic transformation in your productivity and artistic output. This I can promise. Hydrate: I start the day with a big glass of water and a green juice (celery, cucumber, kale, cilantro, kiwi, ginger). We lose a bunch of water while we sleep, so hydrating is very important. Green juice provides an abundance of wonderful nutrients that work so much better for your long-term health than caffeine. Stretch and breathe: I do 15 minutes of stretches. This could be tai chi, qi gong, or yoga. Something that combines movement with deep breathing. 90% of our energy comes from oxygen and most of us are compulsive shallow breathers, using only the top 10% of our lungs. Deep breathing is an amazing way to awaken the body and bring alertness to the mind. Meditate: I do 20 minutes of meditation. Meditation strengthens your mind’s ability to focus, which is essential in the studio. Just as you go to the gym and lift weights to strengthen your muscles, meditation develops your brain’s “focus muscle”. Nourish: I like to start my day with a superfood smoothie. 90% of the average person’s energy is burned by digestion of heavy foods. When you start your day with dense, cooked food like bagels, eggs, meats, cereals etc., it diverts blood flow to your stomach and makes you lethargic. I start my day with a smoothie because the blender takes care of most of that digestive process for me, speeding the nutrients into my body with much less energy. My smoothies consist of mainly raw fruits, vegetables, nuts and other superfoods. Front load your most important activities into your morning. If writing music is really that important to you, make time for it FIRST. Most people start their day by checking their email or Facebook. This will immediately put you into “reaction mode” where you will start responding to all the randomness that hits your inbox. Turn off your cell phone and put it in a different room, far away from you. If you have other people in your home, tell them you’re working on music and you’re not to be disturbed unless the building is burning down. They will, invariably, test your conviction with this request and you will have to reaffirm this boundary when they try to interrupt you with “just a quick question”. Be polite, but firm, as many times as it takes to train them that you’re serious about what you say. Turn off all electronic notifications on your computer (e-mail pop ups, push notifications, software updates, calendar reminders etc.). Computers are great tools for productivity, but they’re also infinite pools of possible distractions. Be ruthless. If you have a landline, unplug it. Work for a focused period, then take a break. I’ve heard that we work best in 90 minute sessions. Just like you need rest in between sets of weights at the gym, give your mind a break between intense sessions of focus. I jet outside on my sun deck to get some fresh air, or take a brief walk, then head back into the studio and re-engage with my session. When I limit the duration of my work sessions, I find I work with much greater intensity and purpose. Exercise. I make sure that I do something active and vigorous once a day. After a solid morning in the studio, I’m usually ready for a larger break. In the afternoon, I find I start to lose energy, so rather than drinking a coffee, I head out for a workout. It could be a ride on my bike, a yoga class, a session in the gym, a run, a swim. Some form of cardio or resistance training. This gets your endorphins going, oxygenates the body, and renews your ability to focus and exert mental and creative energy. For anyone who’s “anti-gym” keep this in mind. After the age of 25, your body will lose 1 pound of muscle per year if you don’t engage in regular resistance training. I see far too many pale, sickly looking producers who look like they’ve been holed up in the studio drinking Jolt for days on end. It’s difficult to be creative and productive if you’re not looking after your body. Batch your repetitive tasks. For anything consistent and administrative in nature, create several times per week for doing them. Examples of this are email, responding to voicemails, paying bills, cleaning, laundry etc. By batching these tasks together and doing them all at once, you will tap into the power of getting “into the zone”, rather than multi-tasking and doing them piecemeal when they pop up. Get up earlier. My goal is to get up a 5am. Morning time is different from evening time. In the early morning, the rest of the world is sleeping and can’t interrupt you. There are no phones ringing. No one inviting you out for dinner, drinks, coffee, whatever. The early morning is peaceful, serene and precious for productivity. Many people say they’re not “morning people” and wake up to be lethargic and unproductive. This is merely a MINDSET; not a fact. If you follow a solid morning routine, like the one above, when you wake, you will be alert and ready to unleash your creativity on the world. Work from a plan. I plan my entire week on Sunday. If that seems like too much all at once, plan each day the night before. When you do this, life becomes so much simpler and more streamlined. When you wake up, you don’t have to deliberate and choose what to do and when to do it, you simply look at your plan and execute. Being a successful music producer requires a set of other supporting activities, such as sound design (creating synth patches, creating audio samples, building effects chains), learning (reading manuals, watching tutorials, taking courses), organizing your library of presets and samples, writing music, mixing music, marketing yourself etc. Planning these activities will empower you to accomplish all of them. Just like having written goals is an essential trait of a successful person, working from a written plan is an essential trait of a productive person. Do you want to learn to powerfully finish what you start? Do you want to tap into unlimited creative energy, and connect with the unique music that lies within you? 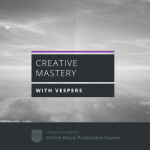 If you want to uncover the secrets to be in a state of flow, increase your mental focus, and break free of frustration and pressure, then definitely check out Creative Mastery with Vespers. Creative Mastery is a online music production course that will powerfully transform the relationship between you and your music. You’ll walk away with techniques to “de-stuckify” yourself, avoid creative traps and roadblocks. Ultimately, you’ll feel more consistently fulfilled with your music. These aren’t pipe dreams, they are results that are within your reach right now. You have an opportunity to take the first step and declare to the world that you want them, and by doing so they will be yours. Learn more about Creative Mastery here.